HISA today released newly published guidelines to protect health information, essential for Australian healthcare organisations. 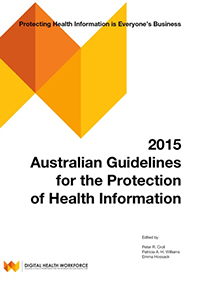 The publication Australian Guidelines for the Protection of Health Information: Protecting Health Information is Everyone’s Business is available for purchase online. “If you are in the business of healthcare, whatever stage you are at on your digital health journey, this comprehensive guide to the protection of health information is essential for reducing your risk,” said HISA CEO Dr Louise Schaper. The editors are Associate Professor Patricia Williams, from Edith Cowan University School of Computer and Security Science; Emma Hossack, CEO of Extensia and Edocx, President of the MSIA and Immediate past President of the International Association of privacy professionals; and cyber security and IT expert Peter Croll, who was also Convener.